Fortunately, Spring Boot and Spring Cloud simplify your microservice applications by providing common and essential features and allowing to focus on business logic by abstracting away the details required for cloud-based development. Just like Spring Framework simplifies enterprise Java development, Spring Boot removes the friction and boilerplate code involved with developing a REST-based service. Similarly, Spring Cloud provides a suite of tools for the discovery, routing, and deployment of microservices to the enterprise and the cloud. So that you don't need to focus on cloud-related details and keep writing the Java application as you do now. Since Java development is now moving towards Cloud and Microservice world, it's probably the best time to learn Spring Boot and Spring Cloud to get ready for great opportunities in near future. In this article, I have shared some of the best books to learn that but if you prefer online courses over books or want to get the best of both world, you can also start with Master Microservices with Spring Boot and Spring Cloud on Udemy. It's very cheap also, I bought in just $13 last year on many of Udemy flash sales which happens all the time. Coming back to books, unfortunately, there are not many good books available on these frameworks, so we don't have many choices but at the same time, the available books are really awesome, so you might not even need choices. As more and more Java developers are learning Spring Boot and Spring Cloud for developing cloud-based Java application, you can expect more books will be written and released on these topics but for now, here are some of the best resources you can check out to learn Spring Boot and Spring Cloud. 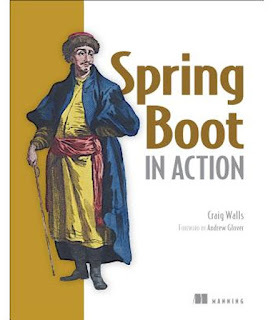 This is simply the best book to learn Spring Boot from none other than Craig Walls, who has taught most of the Java developers Spring Framework by his classic book Spring in Action. Craig has a wonderful ability to explain the complex and tedious concept in simple language with beautiful analogies and you will find many such beautiful examples in this book as well. The book covers almost all the essential topics about Spring Boot starting from auto-configuration, starter dependencies and with a general idea of how Spring Boot simplifies Java development. The book then further explores advanced concepts like Spring Boot Actuator to find out what's going on inside a Spring boot application and Spring Boot CLI for even simpler Java Spring development with Groovy. In short, one of the best book to learn Spring Boot and a must read for Java developer who wants to master the Spring Boot framework. This is a gem of the book on cloud-based Java development and I don't think there is any other book which covers the cloud-based Java development and building a resilient distributed application using Spring. Both authors, Josh Long and Kenny Bastani are an authority on Spring framework and it shows in this book. The intros of different aspects of Spring like MVC, configuration, cloud are very good and they have tried their best to keep this complex topic as simple as possible. In beginning, cloud terminologies and services may seem overwhelming but if you stick around and finish the book you would have to build a strong foundation on building cloud-based Java application using Spring Boot, Spring Cloud, and Cloud Foundry in particular. The book is divided into four major section which covers the basics, developing distributed web services and microservices, Data integration and deployment of a cloud-based application into production, with some guidelines on continuous integration and delivery. In short, one of the most comprehensive guides for developing cloud-based Java application. It's also on my list of 10 books Java developer should read in 2019. This is another great book on cloud-based Java development but focus on Microservices. 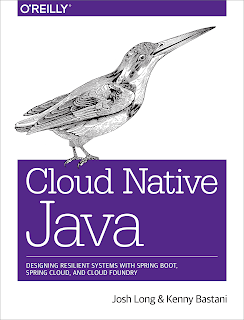 Actually, this is the first book I read on this topic before starting with Cloud-Native Java. The author, John Carnell is a senior cloud engineer with twenty years of experience in Java and it shows in this book. He has done an excellent job of explaining key microservice concepts and patterns like configuration, routing, scaling and deploying your service with real-life examples. This book will also teach you how to build microservice-based applications using Java and the Spring platform. You will not only learn concepts but also get some hands-on experience with microservice design as you build and deploy your first Spring Cloud application. In short, an ideal book for Java developers with some Spring experience who wants to develop Microservice in Java. 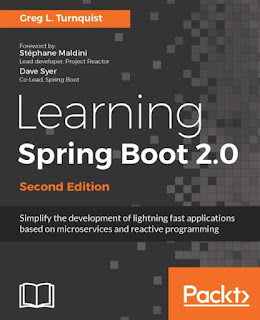 This is another awesome book to learn Spring Boot 2.0, the latest version of the popular Spring Boot framework. The author, Greg is also an authority on Spring and works at Pivotal, the company behind the Spring Framework. He is a member of the Spring Data team and the lead for Spring Session MongoDB. He is also involved with the development of Spring Boot, Spring HATEOAS, and Spring Data REST while also serving as editor-at-large for Spring's Getting Started Guide. All these experience shows in this book. I particularly liked how well he explains things, up-to-minor-level-details. For example, in the first Spring Boot examples, he really explains well what is @SpringBootAppliation is doing in terms of scanning for Spring component recursively, enabling auto-configuration, and also stating that the class itself can be a source of Spring beans. He then goes out and explains log and proves his points, which really consolidate the learning. The book not only covers Spring Boot but also very rich in testing Spring application, as Greg himself is a test junky, having written the Python Testing Cookbook. It also explores the landscape of developing microservice with Spring Boot and deploying Spring Boot application into production. In short, a perfect book to learn Spring Boot for Java developers. This is another, a relatively newer book on Spring Boot by Dinesh Rajput. He is a fellow Java blogger and Spring enthusiast. He is also a Pivotal Certified Spring Professional and author of Spring 5 Design Patterns, another fantastic book on Spring framework. 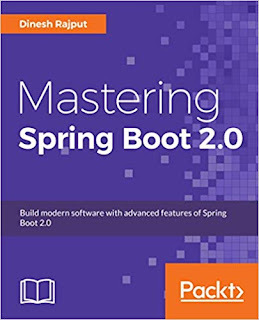 The full title of the book is "Mastering Spring Boot 2.0: Build modern, cloud-native, and distributed systems using Spring Boot" and as the extended title explains it also covers Spring Cloud and cloud-based Java development. In this book, you will start with Spring Boot 2.0, the latest version of Spring framework and then learn essential features e.g. auto-configuration, starter dependencies, Actuator, Spring Boot CLI etc. Once you are familiar with the basics, you will explore advanced things like customizing auto-configuration to meet your expectation. 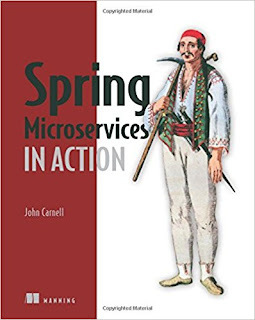 After that, the book explores the Microservice and Cloud landscape by introducing key Spring boot tools and services. In short, the book covers everything you need to know for developing spring based Java microservice, starting from development to testing and deployment. That's all about some of the best books to learn Spring Boot and Spring Cloud, two of the leading Java frameworks for developing cloud-based Java applications. These books will not only help you to learn basics but also gives you the hands-on experience you need to create and deploy your own Java application on cloud. For the most purpose, these books should be enough to learn cloud-based Java development but if you need more assistance, you can also refer to Master MicroService development with Spring Boot for more instructor-led learning. Thanks for reading this article so far. If you like these Spring Boot and Spring Cloud books then please share with your friends and colleagues. If you have any questions or feedback then please drop a note. P. S. - If you want to combine these books with an online course, I suggest you join Master Microservices with Spring Boot and Spring Cloud course on Udemy. One of the better course on the topic and also very affordable.